After taking something of a mid-season break, you might say, a resumption of reviews of the Daredevil Netflix series - and returning to a top-notch episode. This may just be the finest episode of a TV show I have seen all year. And Vincent D'Onofrio is the reason why. This episode of Daredevil explores the titular hero's nemesis, and if you want easy answers for a black-and-white world, there are none to be found here. 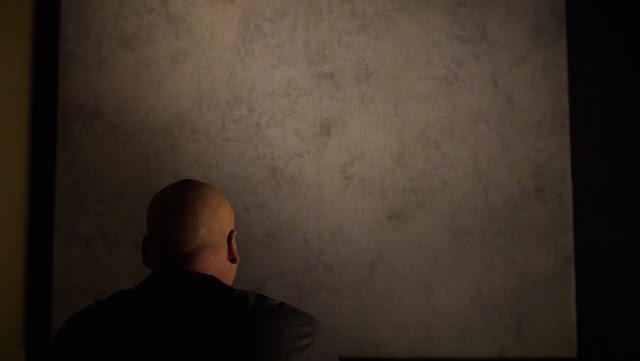 We begin with the morning routine of Wilson Fisk. He wakes, he gazes at the painting he bought from Vanessa, reading into its empty spaces and nebulous shapes whatever he reads into it, he chooses the same colour suit, he chooses the same cufflinks... and he sees a vision of a boy covered in blood. Who is the boy? We don't have to wait long. It's Fisk himself. We meet the young Wilson, growing up in a small home with a father running for city council who is handy with his fists and wanting to make his son in his own image, handing him beer and telling him to be a man, while getting in debt with Rigoletto of the mob - the man the Kingpin replaced in the comics - to fund his election bid. "Gotta spend money to make money" is the justification. But his son is not the man his father wants to be yet. He buckles under the actions of the neighbourhood bully and sitting at home in tears, his father tells him to get his coat and out they go to confront the bully, who has been knocking down the election signs. The confrontation gets violent and suddenly Fisk Sr is beating the bully with a baseball bat. He uses this as a learning moment and tells his son to kick the bully. Again. And again. And again. 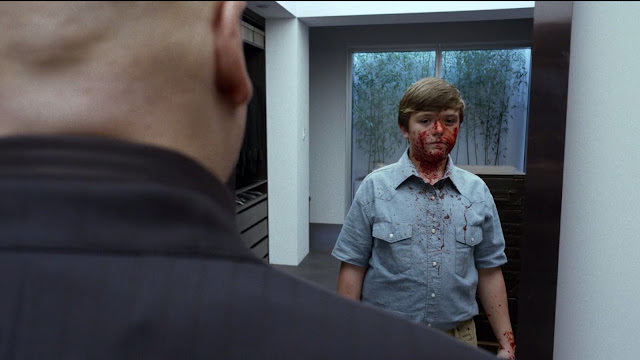 At this memory, the older Fisk wakes up gasping, in tears, and gazes once more at the soothing face of the painting. Detective Blake is still alive despite being shot by Bullseye - the man who doesn't miss? If that indeed was Bullseye, as the episode seemed to be hinting. While the Black Sky child that was despatched off camera by Stick is referred to as "rare", suggesting that we might not have seen the end of that thread. Blake's return to consciousness is the pressing issue for the modern story here, with his partner asked to kill him, and picking a price tag that helps him overcome his conscience when the Kingpin asks of the years spent working together, "How much are each of those years worth to you? In round figures?" When the partner goes to kill Blake, Daredevil intervenes to get what information he can out of the hospitalised cop, but not in time to save his life. The blame, again, is pointed at Daredevil, escaping from the hospital window. Leland Owlsley is getting fitted for a new suit - so Mr Potter makes an appearance. He was mentioned in an earlier episode as the man who makes the Kingpin's suits, and Melvin Potter is The Gladiator in the comics. Here, Mr Potter measures and tests fabrics, while a poster in the background reads "Revenge of the Gladiators". Not many other easter eggs this episode that I could spot, but this one was a nice, understated moment. One other nice moment is the revelation that The Kingpin speaks the languages he has been getting his staff to translate. There's a nice parallel here with the scene earlier in the series where Daredevil speaks Spanish, but says he likes to hear Karen say it. Did I say that looking at the painting was soothing? Oh, the brutal tragedy of it. As a child, Wilson is forced to look at the wall while his father beats his mother. A wall that looks very similar to the painting he owns in later life. When he looks at the painting, it seems to be transporting him back to that time, and to the very specific moment where he stops his father beating his mother. With a hammer. A hammer that kills his father. Just like he was told to kick the bully again and again, so the young boy keeps swinging the hammer again and again. His mother pulls him to one side after the attack... and tells him to get the saw. ...and the woman that may save him. In his darkest moment, outmanoeuvred seemingly on all sides, Vanessa comes to the Kingpin. She reminds him he told her he wouldn't lie. And so he tells the truth, tells about how he killed his father, how they hid the body, and why he still wears his father's cufflinks - "...to remind myself that I'm not cruel for the sake of cruelty, that I'm not my father, that I'm not a monster!... Am I?" D'Onofrio is a towering force of nature as he says that, a trembling wall, a man ready to explode, to destroy the world or maybe just himself. Vanessa accepts him for who he is. But at the same time, she changes him. We see his morning routine again, but this time Vanessa is there too. She pushes him to pick another suit, she stands in the way when he would have looked to see his younger self, she places her hand over his father's cufflinks. He changes. And just as it seems others are closing on him, he changes the game, he stands publicly and announces he wants to save Hell's Kitchen. And everyone else's plans go to hell. Read the episode seven article here.